Margaret was one of the original group that gathered together at the invitation of Todd Zuhlsdorf to form the Rivendell discussion group of the Mythopoeic Society. She and Ruth Berman and I were the only ones from that original gathering, in 1973 or 74 who were still regularly attending. Margaret had been a member of the Society over the years, off and on, and had attended a Mythcon or three. She’s actually pictured at left in the Rivendell photo from the 80s–she is Scraps, the Patchwork Girl of Oz. You can see other pictures of her on her web-page, or further down on this page. She was our guest of honor at Bree Moot 5, after the publication of her novel, The Wrong World. From the Star-Tribune Obituaries page. Published in the Star Tribune on 4/17/2008. Margaret has been a member of the Rivendell Group of the Mythopoeic Society since its inception, in 1973 or 1974. She has also been a member of the loosely related Aaardvaarks writing group. Some of the stories she’s written have appeared in different places, notably a few under the title “Tales Told By the Lonely Mountain,” in The Tolkien Scrapbook. She is pictured here telling some of those stories before the Hobbit Hole at the Minesota Renaissance Festival, back in the mid-70s. For more info (and another picture of Margaret telling stories), see the Tolkien Thoughts page. Over the years, she has read many of her stories and excerpts from her novel, The Wrong World, at the annual Readings From Rivendell meetings held, usually, in December at the University of Minnesota campus. In 2000, the novel was published by FTL Publications. Fleeing from his home world, young Tadko Darusko arrives on the planet Monna searching for his only living relative, his father. But his father is away on a journey, and Tadko is stranded on Monna with no friends, no means of support, and no identity papers. Evading the authorities, Tadko must find a way to survive until his father’s return, hoping that his father can intervene in his case…. Margaret Howes is a storyteller of subtle grace. 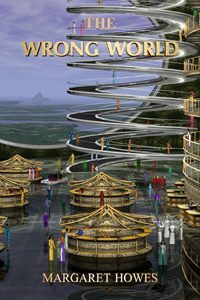 Her “wrong world” is utterly believable, as full of people who are as varied and interesting–and good and bad–as on our own. Tadko is a nice young man, but naive, and his culture is very different from Monna’s. The plot chugs along in a leisurely way that belies its relentless power–and the wonderful, apparently bottomless ability of Margaret Howes to invent detail. No “fate of the universe at stake” here, only one young man trying to stay free long enough to ask his father one question. This is good science fiction, and good story telling, and a memorable ride. If you go there, don’t eat the squelt. Margaret Howes’s novel reminds me of the science fiction I read as a high school student in the 1950s. It has old-fashioned sense of wonder: a vision of a future that is bigger and better than the present. In addition, the novel has a down-to-earth quality that reminds me of the work of Clifford Simak especially, but also Theodore Sturgeon and Isaac Asimov in Caves of Steel. All these classic SF writers put ordinary people with ordinary problems into their stories about aliens, robots and faster-than-light travel. In The Wrong World, a young man arrives on an unfamiliar planet, seeking a father he has never met. But his father is off-world. The young man has no entrance permit and almost no money. His problem? To take care of himself and avoid the police for 80 days, until his father returns. In dealing with this human-sized problem, the hero travels across his father’s planet, meets aliens and many kinds of human, discovers that he has qualities he never expected and learns surprising truths about himself and his home planet. If you think something’s been missing from science fiction in recent decades, try The Wrong World. And if you think recent science fiction has been just fine, try it anyway. 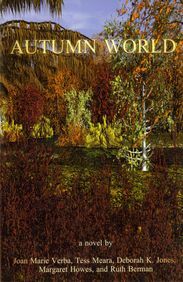 ANOTHER NOVEL, Autumn World, appeared from StoneDragon Press in 2001. This book is co-written by a group of five authors, including Margaret. All of them were once members of a writers’ group today known as the “Aaardvarks.” Since then, the novel has been reprinted by FTL Publications. Where have the flowers and blue grass all gone? I remember I don’t have to mow any more, and then I don’t feel so bad. Margaret also wrote a 1960s Tolkien fan essay in The Tolkien Journal. We’ll be adding that text here in the near future. I may also add a bibliography if I can obtain one. Margaret is also active in the Society for Creative Anachronism, and an Oz fan, with special affinity for The Patchwork Girl. She has made appearances in this guise at Rivendell events in the past. Recently (2004) Margaret was interviewed on the Cable Access television show, TV Bookshelf.